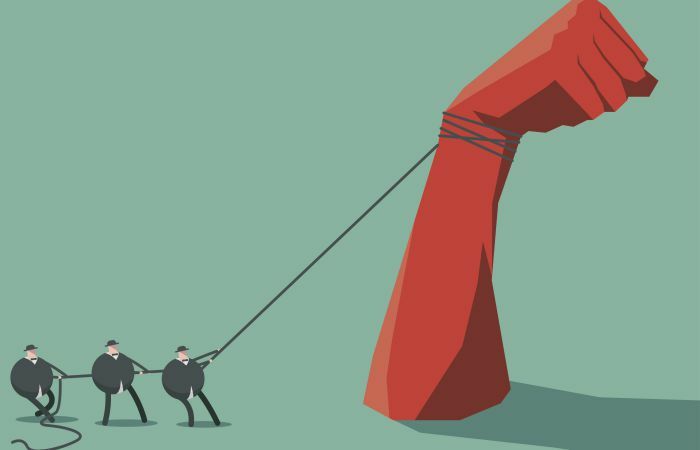 In theory, financial development should enhance economic growth by improving the efficiency of capital allocation and by relaxing borrowing constraints. However, this disregards the issue of which part of society benefits. It has been argued that the less wealthy groups in society benefit more in the early stages of financial development. 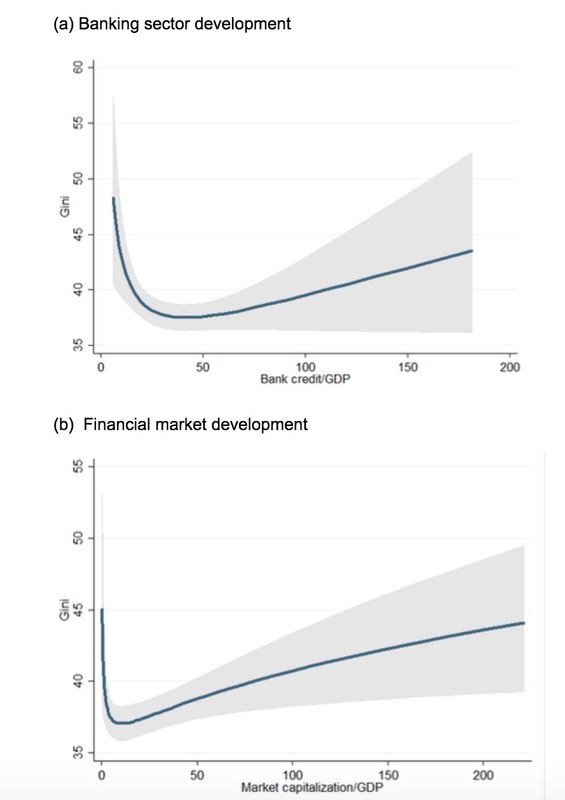 According to this view, the emergence of banks and financial markets primarily benefits the poor by alleviating the market imperfections they face in the form of information and transaction costs associated with the lack of collateral and credit histories (Galor and Zeira 1993, Aghion and Bolton 1997). By abating these credit constraints, there should thus be a concomitant reduction in income inequality. 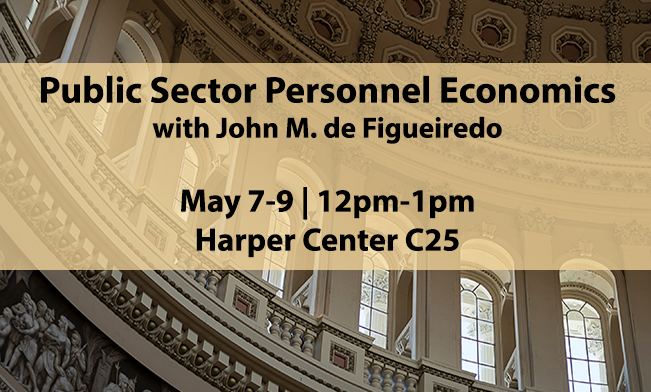 However, there are signs that deep and developed financial systems have been associated with a surge in the top incomes and rents of the financial sector. Philippon and Reshef (2012) found evidence of high labor compensation in the financial sector in times when the financial industry was flourishing. This was the case in the early 20th century and more recently during the decades preceding the Global Crisis. There exist alternative explanations for this phenomenon: it could be due to rising asset management fees and fees associated with expanding household credit (Greenwood and Scharfstein 2013), higher compensation in the ‘risky’ financial industry (Axelson and Bond 2015), or information advantages that magnify rent extraction (Bolton et al. 2016). Other scholars argue that the increased opaqueness and systemic size of banks and financial markets has boosted managerial rent extraction (Kalyta 2009, Stiglitz 2016). 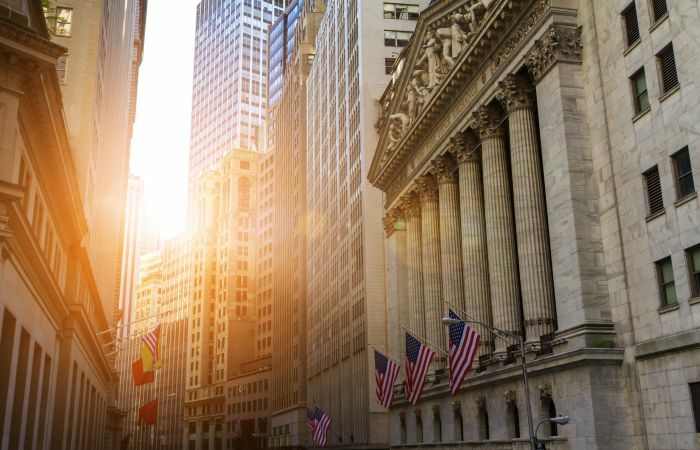 Banks and financial markets serve different clienteles and operate in different segments. Through their closer ties with customers, banks face lower information asymmetries and rent-seeking incentives than firms in financial markets (Beck et al. 2009). This is particularly so for stakeholder-oriented banks where clients constitute the ownership base and participate in a bank’s decision-making process (Cornée and Szafarz 2014). Taken to the extreme, it has been argued that financial innovations boosting financial market development have proved exploitative and predatory in nature (Allen 2012). Over the last few decades, financial markets have gained importance relative to the traditional financial intermediation offered by banks. 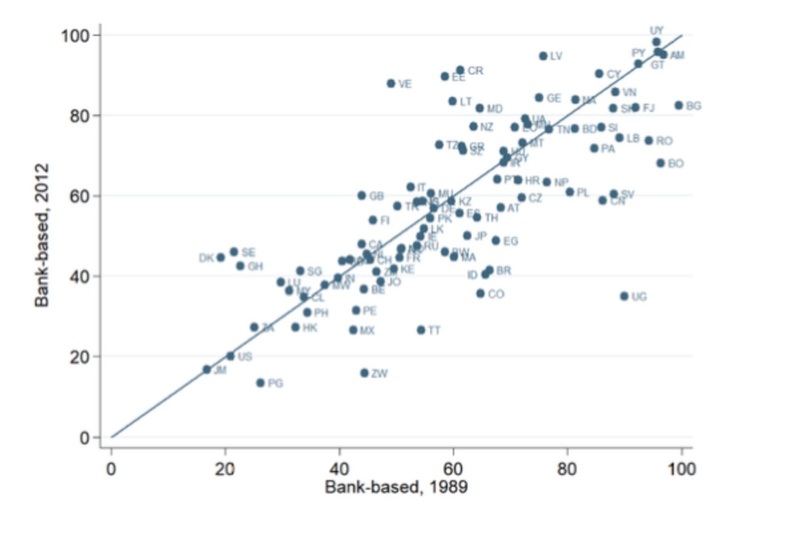 This pattern is visible in Figure 1, which plots the share of bank-based funding in total funding for individual countries in 1989 (horizontal axis) versus 2012 (vertical axis). Since the end of the Cold War, market-based intermediation gained ground as the majority of countries have seen their financial structure shifting from bank-based to market-based (below the 45-degree line). Closer inspection reveals that these changes mostly concern emerging market and transition economies. Note: The ratio of bank credit is expressed as a percentage of the sum of bank credit plus bond and equity market capitalization. A higher value of the indicator suggests financial structure that is more bank-oriented. A dot that is below (above) the 45-degree line indicates that a particular system became more (less) market-oriented in 2012 compared to the initial value in 1989. Sources: World Bank World Development Indicators; authors’ calculations. Income inequality can be measured by the Gini coefficient, developed by Corrado Gini in 1912. Using the Lorenz curve of the distribution of income, it measures the deviation from perfect equality where every individual earns the same share of income. A higher Gini coefficient means that a country is further away from perfect income equality and that inequality is rising. 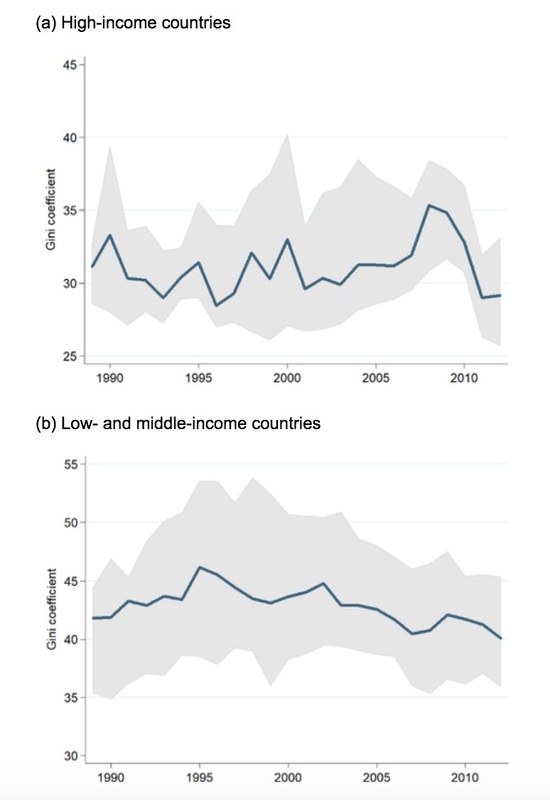 Figure 2 shows that income inequality has been rising among high-income countries since the mid-1990s, before peaking at the onset of the Global Crisis. Since then, inequality has decreased considerably. In low- and middle-income countries, the dispersion of incomes has been wider in most jurisdictions, as evidenced by a higher median of the Gini coefficient. However, the trend differs compared to advanced economies. Specifically, income inequality reached its peak much earlier – in the mid-1990s – before gradually declining and converging across countries, as evidenced by a decrease in the dispersion of the Gini coefficients over time. Note: Median, 25th and 75th percentile values are shown. A high-income country is defined according to the World Bank classification as of 2012 with a gross national income per capita above US$12,476 calculated using the Atlas method. Low- and middle-income countries are the remaining countries. Sources: UNO-Wider WIID3.3, Standardized Income Inequality Database. Authors’ calculations. Making causal inference is a challenge here. The link between finance and income inequality can go either way. More finance can lead to more income inequality, but more inequality may also foster the development of banks and specialized financial services. A common identification strategy employs instruments that are correlated with the financial structure but not correlated with income inequality. Following the literature, in a recent paper (Brei et al. 2018) we instrument the development of banks and financial markets by their initial values, legal origin, societal fractionalization, and the location of countries (relative to the Equator). Furthermore, we control for other determinants of income inequality, including the degree of education, industrial specialization, and inflation. The main results of our regression analysis are represented in Figure 3. Both higher bank activity and higher market activity translate initially into lower income inequality. However, this pattern reverses beyond a certain threshold. The trajectories of income inequality, once the threshold is reached, differ for bank-based versus market-based financial development. Specifically, the subsequent rise in income inequality is much steeper in market-based financial systems. This suggests that the development of financial markets over the last decades could have produced an increase in income inequality. Note: The non-linear effect is calculated from the regression in column (II) of Table 3 in Brei et al. (2018). The marginal effects are calculated at average values of the regression variables. The shaded area shows 95 percent confidence bands. In their seminal work, La Porta et al. (1999) argue that legal systems originating in the common law tradition tend to offer higher protection to holders of equity and debt securities. This higher investor protection may in turn influence the way financial systems develop and how rents are extracted and distributed. Splitting the sample into common and civil law countries, the results on market-based financial development are confirmed for the two country groupings. There is, however, a difference in the way the rise of banks affects income inequality. In civil law countries, the results are similar—more banking is initially associated with inequality reductions, but once a certain threshold is reached, income inequality increases again. In common law countries, in contrast, banks seem to provide their services in a way that does not influence the distribution of incomes. Our findings thus suggest that market-based financial development has been a driver of inequality in the financial systems of the common law countries, whereas both bank-based and market-based financial development could have influenced inequality in the civil law countries. Aghion, P and P Bolton (1997), “A Theory of Trickle-Down Growth and Development,” Review of Economic Studies 64: 151–172. Allen F (2012), “Trends in Financial Innovation and Their Welfare Impact: An overview,” European Financial Management 18(4): 493–514. Axelson, U and P Bond (2015), “Wall Street Occupations,” The Journal of Finance 70(5): 1949–1996. Beck, T, A Demirgüç-Kunt and P Honohan (2009), “Access to Financial Services: Measurement, Impact, and Policies,” The World Bank Research Observer 24(1): 119–145. Bolton, P, T Santos and J A Scheinkman (2016), “Cream‐Skimming in Financial Markets,” The Journal of Finance 71: 709–736. Brei, M, G Ferri and L Gambacorta (2019), “Financial Structure and Income Inequality”, CEPR, Discussion paper 13330. Cornée S and A Szafarz (2014), “Vive La Différence: Social Banks and Reciprocity in the Credit Market,” Journal of Business Ethics 125: 361–380. Galor, O and J Zeira (1993), “Income Distribution and Macroeconomics,” Review of Economic Studies 60(1): 35–52. Gini, C (1912), “Variabilità e Mutabilità,” Reprinted in E Pizetti & T Salvemini (eds) (1955). Memorie di metodologica statistica, Rome: Libreria Eredi Virgilio Veschi. Greenwood, R and D Scharfstein (2013), “The Growth of Modern Finance,” Journal of Economic Perspectives 27(2): 3–28. 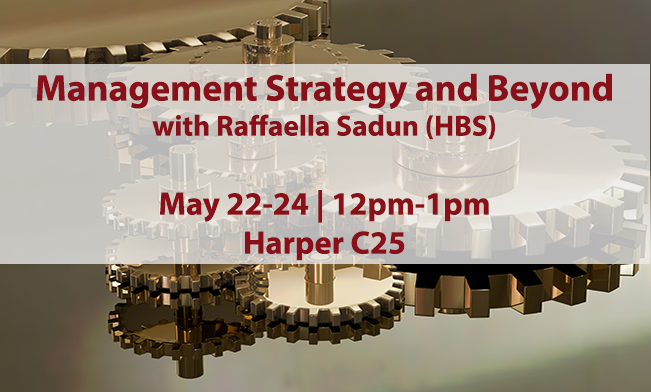 Kalyta, P (2009), “Compensation Transparency and Managerial Opportunism: A Study of Supplemental Retirement Plans,” Strategic Management Journal 30(4): 405–23. La Porta, R, F Lopez-de-Silanes, A Shleifer, and RW Vishny (1998), “Law and Finance,” Journal of Political Economy 106(6): 1113–55. Piketty, T (2014), Capital in the Twenty-First Century, Cambridge: Belknap Press. Philippon, T and A Reshef (2012), “Wages and Human Capital in the US Finance Industry: 1909–2006,” Quarterly Journal of Economics 127(4): 1551–1609. Stiglitz, J E (2016), “New Theoretical Perspectives on the Distribution of Income and Wealth Among Individuals,” Inequality and Growth: Patterns and Policy, Palgrave Macmillan UK: 1–71.